The Department of International Languages and Cultures (ILC) in the College of Arts & Sciences has announce its 2016 selections for the Webster University/Universidad Nacional de Cuyo student exchange program. Webster freshman Felix Cramer has been selected to spend the Fall 2016 semester in Mendoza, Argentina. Universidad Nacional de Cuyo student Maria Mercedes Romero Day has been selected to spend one year at the Webster University home campus in Webster Groves. 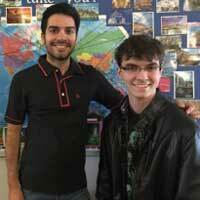 As this year's program concludes, ILC's current Argentinian teaching assistant, Matias Ochoa, returns home to Argentina in May 2016. The student exchange program has been in place since the fall of 1988. Graciela N. Corvalan, professor of Spanish, created the program and is still active in its continuation. Webster students are immersed in the culture of Argentina as they enroll in courses, participate in sports and activities and live with a local family. Webster students are also expected to teach English courses as a part of the exchange program. The teaching assistants from Universidad Nacional de Cuyo receive a salary and housing while at Webster, where they are equally immersed into American culture and also teach Spanish, host language tables and help with special events in the ILC. This exchange program demonstrates Webster’s core values of diversity and inclusion. It is an excellent opportunity for the students who are selected, but also benefits other students who are able to interact with them during their exchange. The ILC is grateful to Ochoa for the contributions he has made while at Webster and excited to welcome Maria Mercedes Romero Day in August. “What I have enjoyed the most has been meeting new people from different cultures and getting to know myself," Ochoa said. That is something Cramer hopes to get from his exchange experience. He has previously taught English in both Germany and Mexico; he thought this exchange program was a natural next step. It will also help him decide what he wants to major in and what he’ll do after graduation; he is currently considering a career in teaching or Foreign Service.